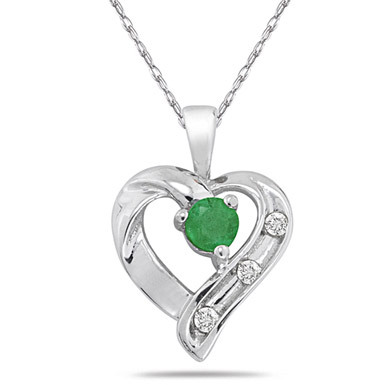 A delicately sculpted heart pendant features a natural emerald center stone with 3 diamond accents. The pendant is rhodium plated to prevent tarnishing. Pendant comes with an 18 inch chain in .925 sterling silver. We guarantee our Emerald and Diamond Heart Pendant in .925 Sterling Silver to be high quality, authentic jewelry, as described above.